Many people have been hearing the name Cambridge Analytica for the first time recently, following the revelation that they obtained the personal information of around 50 million people by abusing Facebook’s lax permissions system. I first heard of the company about a year ago, after reading an article by Carole Cadwalladr in the Guardian. Click here to read that piece. CA began as an offshoot of a British company called Strategic Communications Laboratories, a research group looking into how to influence opinions on a large scale. The CEO and founder was, until very recently, Alexander Nix. Cambridge Analytica’s major shareholder is Robert Mercer, a billionaire computer scientist and investor, who had specialised in creating Artificial Intelligence systems that were capable of understanding language. The Vice President of the company was Steve Bannon, who was also chairman of Breitbart News, the right-wing website that favours sensationalism and prejudice over journalistic integrity and facts. Together with a gifted young employee called Chris Wylie they created data analysis software that could determine a persons political intentions based on a variety of personality traits. Using this software, combined with a large enough dataset (obtained by nefarious means, as it turns out) they realised they could direct highly personalised online content to users, based on their analysis of what would appeal to their nature. Armed with this revolutionary political weapon CA went into the election business. SCL, their parent, already had contracts in place with branches of the US government. CA worked to push news stories, real and imagined, that would reinforce whichever candidate they were working for. An American researcher called Jonathan Albright noticed a surge in the number of propaganda style news articles being delivered, and decided to research them. His efforts are documented here. It’s fair to say that the 2016 presidential election result took a lot of people by surprise. Nobody in the established political arena expected Donald Trump to win. 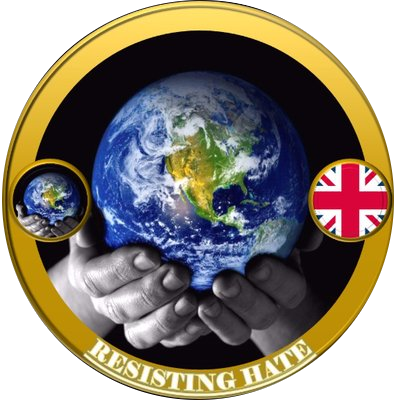 We at Resisting Hate were mortified. How could this simple-minded, bullying pervert have convinced people to vote for him? He didn’t even get the most votes, but he did get the most votes where it counted. Voters were targeted with adverts, news and videos showing “Crooked” Hillary as some kind of enemy to the US, sites like Breitbart were openly hostile to her, and people were swayed. His campaign was managed with the assistance of CA, and Steve Bannon was rewarded for his efforts by being appointed as President Trump’s chief strategist. 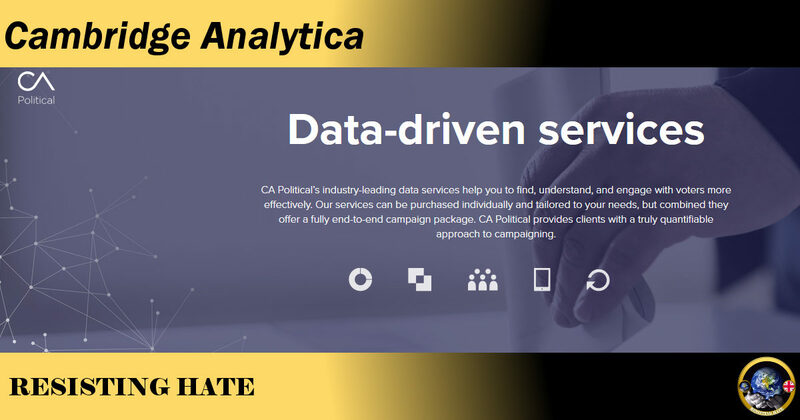 CA’s involvement in the Brexit campaigns is highly controversial, as it is claimed that the company worked for the two rival Leave campaign groups via different companies. It’s also claimed that they made no charge for their services to LeaveEU. The allegations made are that Aggregate IQ (employed by Vote Leave) was working alongside CA, and in doing so exceeding the overall campaign funding limits. 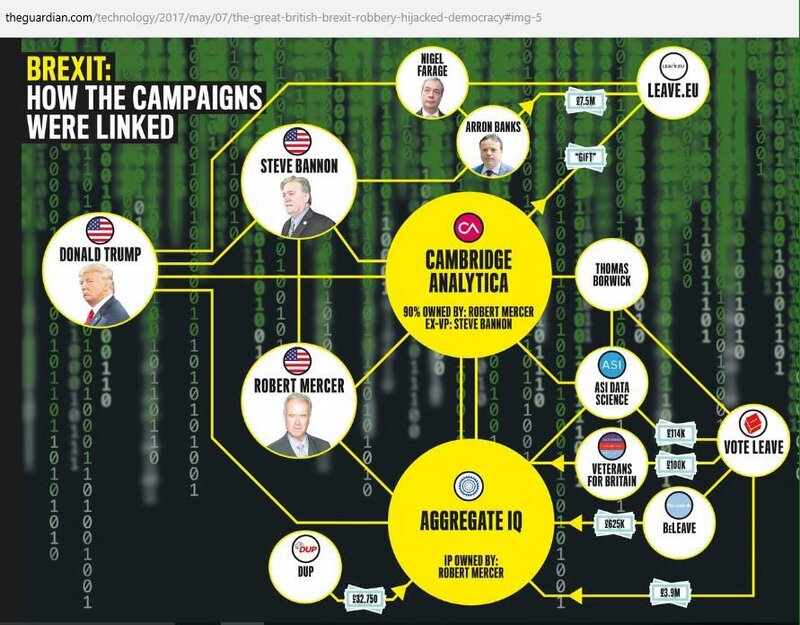 How the Leave Campaigns and Mercer/Bannon/Trump connect. The story that has exploded onto the news over the past week comes about due to the way Cambridge Analytica obtained their data, the personal information used to determine people’s likely reactions. The raw data was obtained by a researcher paying Facebook users to take an online personality test. This in itself was legitimate, but what ensued was not. The Facebook app needed user permissions to access their accounts, but what they didn’t realise was that as well as their own accounts, they were also permitting access to their friends list, and the system trawled through, analysing the personality traits of everyone who was linked to the person taking the test. That was the first problem, the second was that the data was then taken by Cambridge Analytica and used in ways that broke Facebook’s privacy rules. Companies holding the data were instructed to delete it, and provide confirmation that it had been deleted. CA didn’t delete their database, and continued using it, which is why they are now being investigated by Data Protection agencies in both the US and UK.